Kicking off a new series of themed posts, I think it's high time I migrated my earliest Jerusalem Post cartoons over from my moribund first blog, three years to the day after they first appeared. 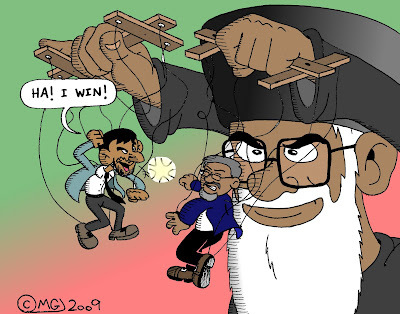 It doesn't matter who "won" the Iranian elections; there's only one real winner... the puppeteer. To further elaborate on this three-year-old news item: despite the fact that hardliner Mahmoud Ahmadinejad beat more moderate candidate Mir-Hossein Mousavi in an Iranian presidential election widely assumed to be not quite kosher, it didn't make much practical difference since in either case the ayatollahs would still remain the power behind the throne.